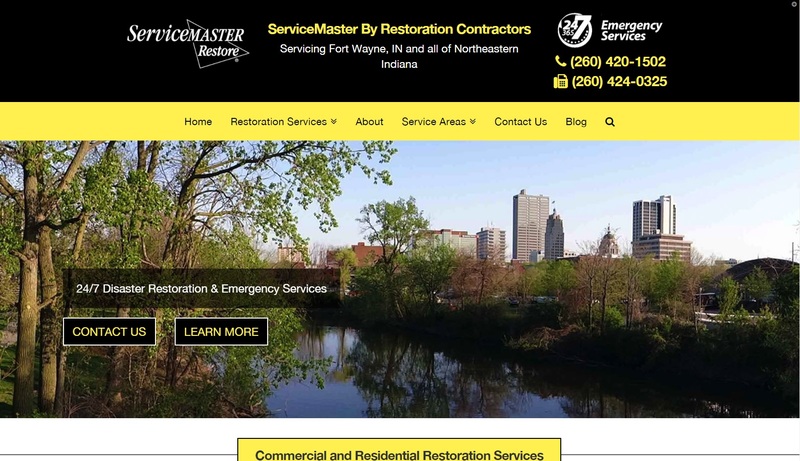 ServiceMaster by Restoration Contractors has been a family-owned and operated business that has been serving the Fort Wayne, IN and Northeastern Indiana area since 1975. They provide a wide range of disaster restoration services including: water damage restoration, fire damage restoration, mold removal, wind and storm damage restoration, and more. They are a preferred vendor for a number of local insurance agencies, are IICRC and QRV-certified, and hold an A+ rating with Better Business Bureau. In addition, each of their technicians attend frequent training sessions to remain updated on all of the latest restoration trends and are available 24/7 for all property emergencies. After receiving the initial call, they will arrive to the property within 1-2 hours with professional equipment to effectively and efficiently restore the residential or commercial building to its original condition. After working with Proceed Innovative to develop a modern and optimized website, ServiceMaster by Restoration Contractors has an established online presence that will continue to grow over time with frequent updates, blog posts, additional service pages, and more. The design features a user-friendly navigation, is mobile-friendly, and provides detailed information about who they are as a company, the services they provide, and the areas they serve; overall, it is designed to provide customers with a seamless experience. Proceed Innovative also understands the sense of urgency for the restoration company’s customers, which is why the developers had also included the ability to conveniently contact them from any service page, via click-to-call, click-to-email, or contact form. As a result, both Proceed Innovative and ServiceMaster by Restoration Contractors look forward to the continued growth and success of their website as well as their online presence.